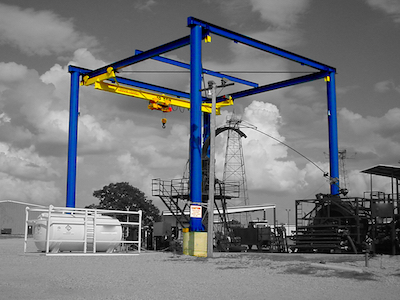 Bridge Crane Specialists concentrate specifically on the customized design, manufacturing, installation, and servicing of overhead and work station crane systems. We are dedicated to safe, efficient, and practical solutions to meet customer’s material handling needs. Each system is specifically engineered to meet our customer’s requirements in compliance with guidelines established by CMAA, ANSI, AISC, and OSHA. Bridge Crane Specialists also offers a select inventory of used and surplus crane and hoist products which includes used overhead cranes, used hoists, and other parts available for purchase. Bridge Crane Specialists will provide a solution for the most complex and challenging problems that face your business. It is our goal to improve your efficiency, increase your productivity and ensure your safety while assisting in the overall success of your business. Take a look at some of our solutions.